The time of year where I start hoarding pumpkins, asking friends if they will be using the ones they had sitting on their porch steps now that Fall is ending, and seeing if I can make them last into the new year. Last year I was still baking pumpkin seeds in January! This is not an exaggeration! I love me some pumpkin seeds, so I figured I would share my favorite recipe again, for anyone who loves them as much as I do!! Step 2) Cut open pumpkin and scoop out seeds. Then place all the seeds in a bowl of semi-warm water. I let the seeds soak for a minute or two and swoosh them around the get the stringy pulp separated. The pulp should settle to the bottom and then I fish the clean seeds out and place them on a paper towel. I like my seeds to be cleaned (no thick pulp), but not too clean (still a little orange film), because I think it adds more of that pumpkin seed yumminess when finished. Step 3) Pat the seeds dry with a paper towel. I will usually do this twice, transferring the seeds from the first paper towel to a second in between patting (that way the seeds aren't sitting on a wet paper towel). The new paper towel will help to soak up some of the extra moisture, but I don't ever wait for the seeds to dry. Some people will tell you that's a thing (and that you must wait), but I am too impatient to have that be one of my things, so they are still moist when I stick them onto their baking sheet and this method hasn't failed me yet! I prep the baking sheet with aluminum foil and a sprinkle of olive oil (makes cleanup a cinch). Ooooh, yum!! 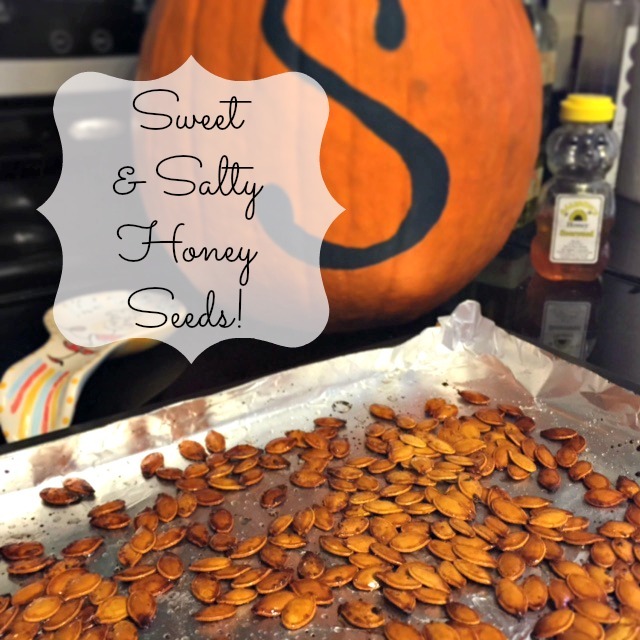 I'll have to try this next year :) I hate straight roasted pumpkin seeds but adding honey sounds delish.